Place all the ingredients in a blender. Process at medium speed for about 2 minutes or until soft. For a different version, add a little bit of orange juice or maybe a little more fruit like bananas or kiwis. 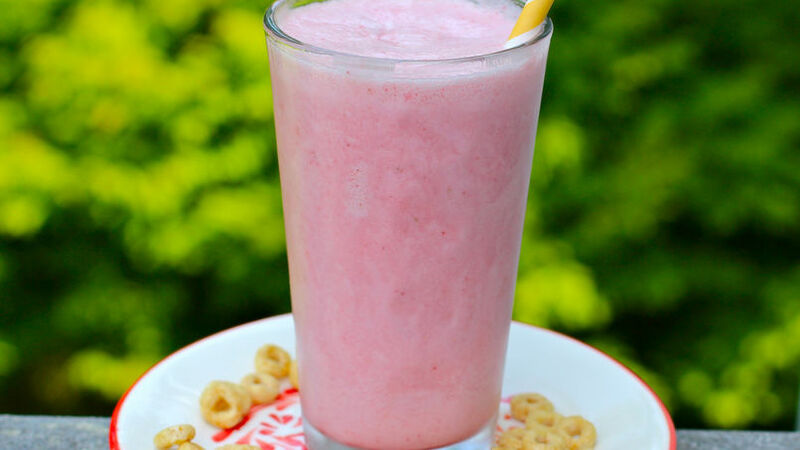 This strawberry shake with almond milk is one of my favorite shake recipes. What I love most about it is that it only takes a few minutes to prepare. When it comes to shakes, I firmly believe that less is more. I like truly tasting the fresh fruit and making use of simple ingredients. A handful of fresh strawberries, Honey Nut Cheerios™ and a bit of almond milk all come together to create the perfect combination. It’s a refreshing drink that can be served as breakfast or a snack.